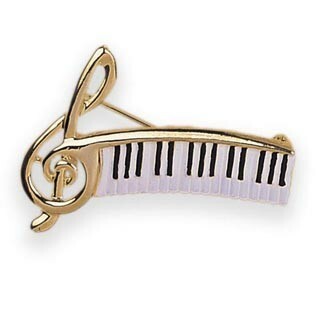 Piano Keys and Treble Clef Brooch – With this amazing brooch you can add a little class to your wardrobe! The brooch consists of a musical note attached to a piano keys design. A fun and whimisical gift for a piano player. It’s perfect for a jacket, hat, backpack and much more! Bring your sense of style to the next level with this unique jewelry piece. Made from gold tone metal and enamel. Size: 2.25″ x 1.5″. Piano Jewelry for Piano Players!